While the online part of GTA 5 is developing at full force, and players who opt for the online mode, continue to get new weapons, gear and vehicles, the remaining players, i.e. those who preferred a single mode of the game, sitting with nothing. Recently in GTA Online has published a new global update “Doomsday”, and with it the game has a flying car and the jetpack. 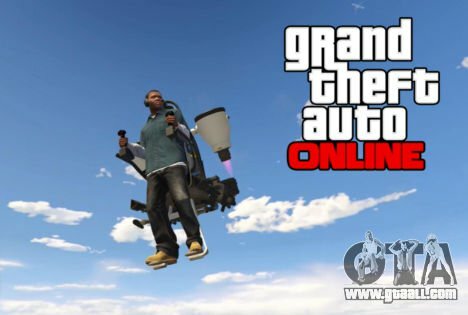 If you are one of those who love alone to wander through the streets of Los Santos or blaine County, district, instead of to experience the work of hackers online, we have great news for you: thanks to the modders in GTA 5 jedijosh920 each of you has the opportunity to get the jetpack Mammoth Thruster. To unlock it you must complete one small mission, arriving at midnight on mount čilliad. Remember: the truth is out there. After completing the mission, you unlocked the jetpack will appear in certain places on the map where you will be able to use it, and change its color or set to jet engines or additional remedies.